Life in itself often isn't fair to most people. Sure, there can be periods of good fortune but those are usually achieved by sheer coincidence. What's more likely to happen are moments of self-awakening, knowing that your existence won't go off without a hitch. Pedro Almodóvar's Julieta in particular follows this belief. The titular character (Emma Suárez) is haunted by her past actions, wanting to understand why her daughter abandoned her all those years ago. To do so, she needs to delve into key moments she endured when she was younger. Will Julieta find the answers she's looking for? As Almodóvar has shown before, he's compelled by complicated women of a certain age. (If only Hollywood felt the same.) He doesn't deny that we're a flawed species, how our emotions tend to get the better of us. And more often than not, those emotions are brought on by what life throws at us. 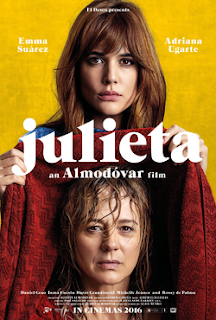 Julieta continues to prove that Almodóvar is the Douglas Sirk of the new century. The matter of melodrama can be rather fickle in general, and only a few properly capture its essence. And as the Spanish-born director has proven since his debut in 1980, he is one of those select few. 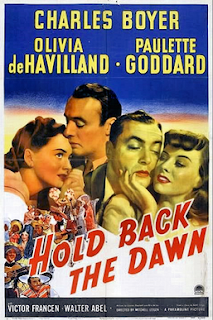 Mitchell Leisen's Hold Back the Dawn opens with a bit of fourth wall breakage, perhaps not a surprise with Charles Brackett and Billy Wilder as the film's writers. In an attempt to earn some quick money, Georges Iscovescu (Charles Boyer) tries to sell his story to film director Dwight Saxon (Leisen). But what is his story? Stuck in a Mexican hotel full of fellow immigrants, Georges waits impatiently for the paperwork needed to get into the United States legally. He learns from his former dancing partner Anita Dixon (Paulette Goddard) that she found a quicker solution; she simply married and quickly divorced an American to citizenship. Inspired by this, he finds a potential mark in visiting schoolteacher Emmy Brown (Olivia de Havilland). Will he succeed? This being a work penned by Brackett and Wilder, there is cynicism all over the place in Hold Back the Dawn. (Certainly a stark contrast to some of Leisen's previous films.) Like their later works The Lost Weekend and Sunset Boulevard, the only reason their embittered protagonist is still existing is that of an idealistic woman in their life.